Osmanium Candy Company | Creators of Innovative Candy Products | GO TEAM GO! Hello and welcome to Osmanium Candy Company, Wholesale/Distributors of Innovative candy products. The company began in November 2004, while on break from school, in an apartment kitchen with a double boiler, some ingredients, a laptop, and a sweet tooth. We officially incorporated in 2006 and now have our factory nestled on the south side of Milwaukee, Wisconsin. We create candy products that fuse gourmet ingredients with functional benefits, as well as regional favorites. We are also proud to promote an environment of creativeness, resourcefullness, entrepreneurship, and community involvement. Since 2004 we have been involved in developing over 13 different products, both functional and non-functional. Our products have been featured in numerous newspapers such as the Wall Street Journal, on television, and throughout the popular media. Osmanium's first product, Crackheads® was released in 2006 and is currently sold nationally and internationally. Our next product, Jitterbeans® and Crackheads2®, pronounced "Crackheads squared", is a Super-Caffeinated Chocolate Covered Espresso Bean with a Crunchy Candy Shell. Each box contains 600mg of Caffeine! That is equivalent to 7.5 Red Bulls®! is currently being sold both nationally and internationally. Our newest product released late July 2014 is Candy Old Fashioned™!, a scrumptious gummi with the flavor of Wisconsin's favorite cocktail, the Brand Old Fashioned (sweet)! Our products are sold in retail establishments, convenience stores, grocery stores, specialty shops, manufacturing businesses, and on-line. .
We also private label and offer promotional products, which are great ways to promote your business! 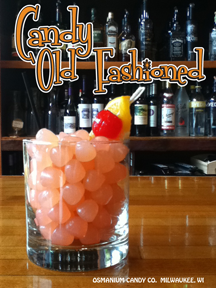 Wisconsin's favorite cocktail, the Brandy Old Fashioned Sweet is now a gummi candy! 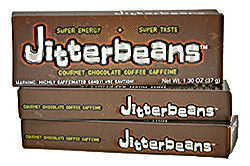 Jitterbeans™ are a unique and delicious blend of gourmet dark chocolate, espresso beans, and caffeine. One box of Jitterbeans® has the same caffeine as approximately 6 cups of coffee! Supreme taste with a huge energy boost. 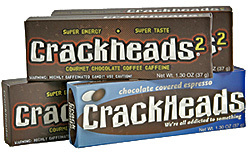 Crackheads® are a unique and delicious blend of gourmet white and dark chocolate covered espresso beans. Each box has the equivalent caffeine of approximately 2 cups of coffee. Next, Crackheads2® is a gourmet dark chocolate covered espresso bean with a hard candy shell and a caffeine supplement addition. Each Crackheads2® box contains the equivalent caffeine in approximately 6 cups of coffee. © Osmanium Candy, LLC All Right Reserved.